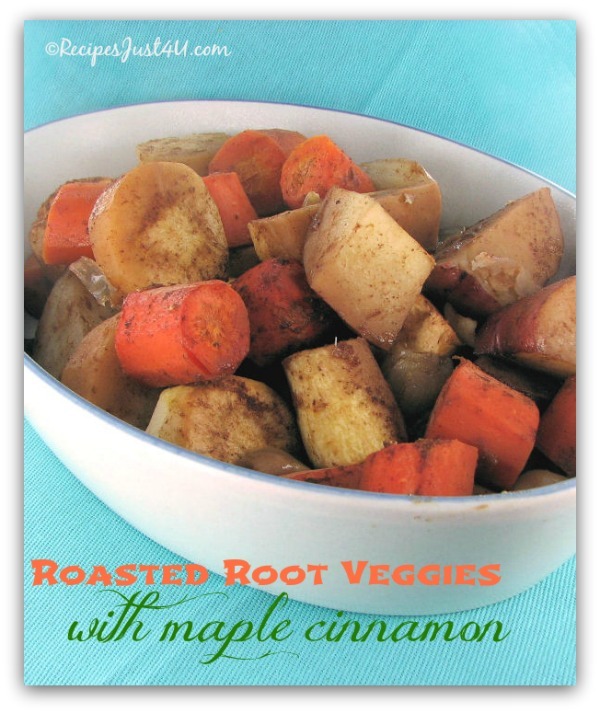 These roasted root vegetables use maple syrup and orange juice as well as cinnamon and ground cloves to give the dish a wonderful level of taste. I love to roast vegetables. Cooking them in the oven brings out their natural sweetness and adds a lovely flavor to them. 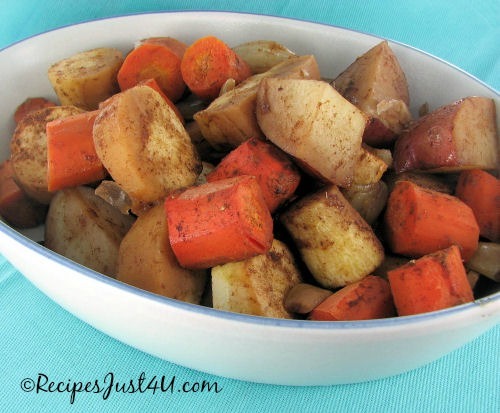 For another way to roast veggies, see my roasted carrots and mushrooms side dish. Don’t know how to cook veggies in the oven? See my tips for roasting vegetables here. For another great roast vegetable recipe idea, try this roasted beet salsa. It’s easy to make and tastes amazing. We served this recipe for Christmas dinner this year, but they are easy enough to share all year round. Start by poreheating your oven to 375º F and spraying a 9 x 13-inch baking dish with cooking spray. 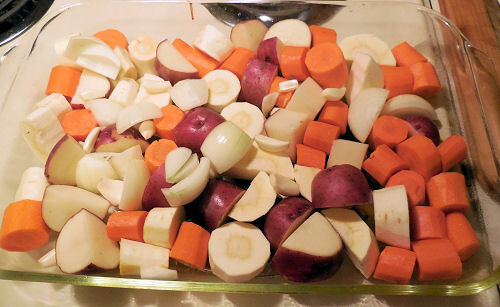 Next, combine your vegetables and place them into the prepared baking dish. Any root vegetables will do. I used carrots, parsnips, onions and regular potatoes. Sweet potatoes would also work well. The main thing is to try and get your pieces a similar size. 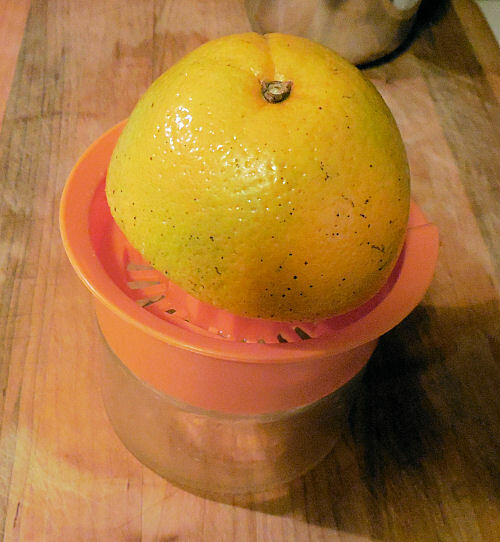 Juice two oranges and set this aside. This will give cut the maple syrup a bit and make the dish savory sweet. 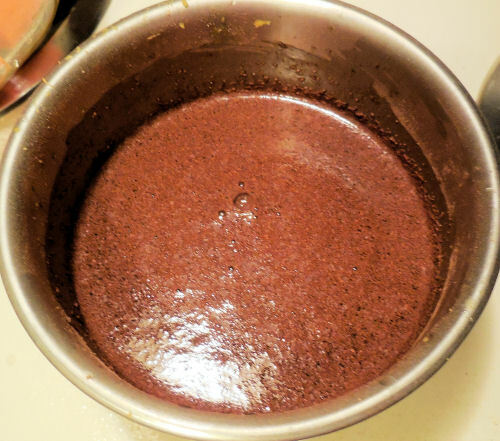 In a bowl, add the orange juice and whisk together the rest of the ingredients until light and frothy. and pour the mixture over the vegetables, tossing to coat well. Cover the dish with aluminum foil and bake for 45 minutes. Remove the foil and bake an additional 20 minutes, tossing after 10 minutes to coat with the cooking liquid. Be sure to toss the vegetables again before serving. Bring the flavors of fall to your dinner table with these roasted root vegetables. They have a lovely flavor of closes, maple and cinnamon. Preheat the oven to 375 º F and spray a 9 x 13-inch baking dish with Pam cooking spray. (be sure to spray the pan or the veggies will stick. 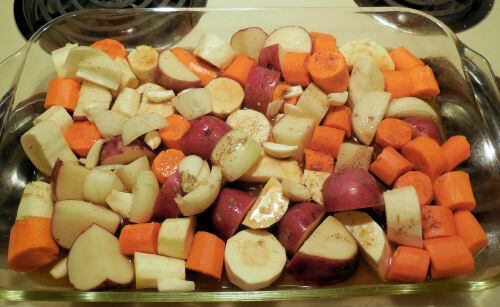 Combine the vegetables and place them in the prepared baking dish. In a bowl, whisk together the rest of the ingredients and pour the mixture over the vegetables, tossing to coat well. Cover the dish with aluminum foil and bake for 45 minutes. The remove the foil and bake an additional 20 minutes, tossing after 10 minutes to coat with the cooking liquid. Toss the vegetables again before serving. Serve with your favorite protein choice for a hearty and delicious side dish.